Dave's Whisky Reviews: Archive: Islay Trip 2015- Springbank. I just got back from a great trip to Campbeltown and Islay a few days ago and thought that I'd post up about my tours and the whiskies. 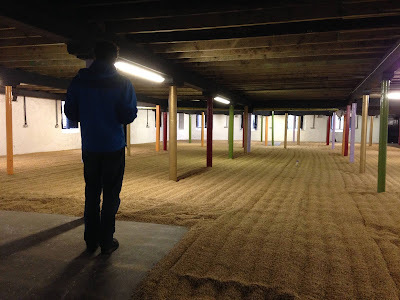 First up was Springbank in Campbeltown. Unfortunately we were only there one night and had to get the ferry to Islay the next day, so we didn't have time for the Cadenheads warehouse tasting or Glengyle or Glen Scotia but managed to squeeze in a quick tour at Springbank Distillery before the ferry. Very interestingly Springbank don't have a visitors centre at all really. They do everything through the Cadenheads shop just down the road, which caused some confusion since we thought Cadenheads wasn't open until after the tour started (sigh), oh well! The tour itself was great, Jim (I think) was taking us round. Very friendly guy who explained everything really well and in an interesting way (even for my girlfriend!). 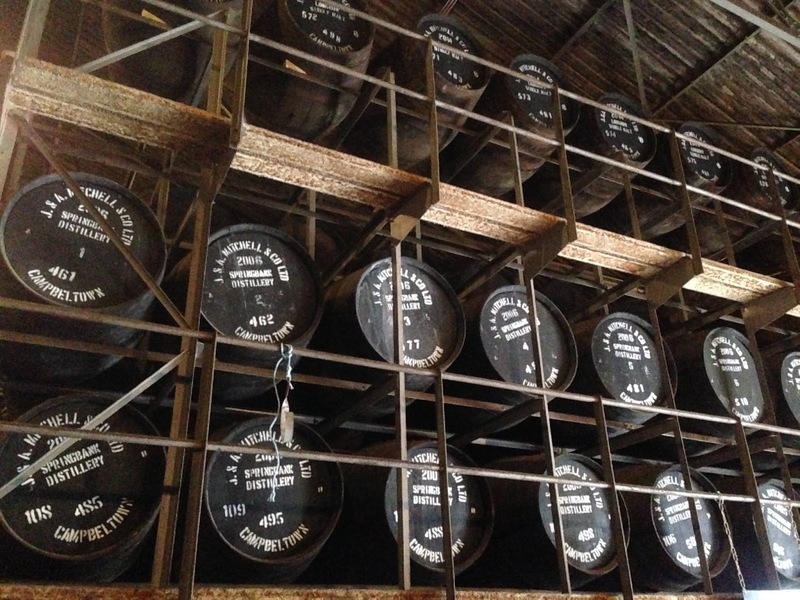 Springbank are as traditional as it gets; on site maltings, dirty peat, traditional mash tun, Oregon Pine washbacks, direct fire wash still (unfortunately not spirit) and traditional maturation AKA epic Sherry casks. All contributing to the epic Springbank funk. We also got to see the bottling plant, where they were doing everything by hand, including hand filtering the whisky. At the end of the tour we went to the Cadenheads shop where we were given a miniature made exclusively for visitors doing the tour. (Flashback) Earlier this year I went to a Springbank tasting in Cardiff taken by these two great guys: Cameron and Grant, who I remember because I saw them the next day at the Bristol Whisky lounge. So when I saw Cameron walk out into the shop I immediately recognised him. It was really good to see him and I'd been really looking forward to the Springbank shop because Cameron had told me at the tasting about a cage they have at Springbank with bottles from single casks, but these bottles are the only bottle drawn from the cask at the time, so are completely unique. Unfortunately the cage was pretty empty when I was there and they sell out very quickly, but Cameron gave me a dram of Springbank 10 (which I hadn't tried yet) while I chose a bottle. Nose: Full, fruity and fresh. Heather smoke, juicy fruit, quite oily. Taste: Very thick and oily. Sweet with juicy fruit and some sherry. Heather, smoke and peat. Finish: Medium length. Silky with fruit and a little spice. In the end I chose a refill bourbon 10 year old from 2005, which I will (hopefully) review in due course. I also had the great struggle of saving my money for the rest of the trip and not spending it all in the Cadenheads shop. Lucky, despite some close calls, my wallet remained unscathed other than that. Next up: First day in Islay- Bowmore, Caol Ila and Bunnahabhain.